A home’s curb appeal can go a long way. But keeping your home or bussines in pristine condition year after year can be quite difficult, considering that all interior and exterior surfaces will eventually deteriorate. 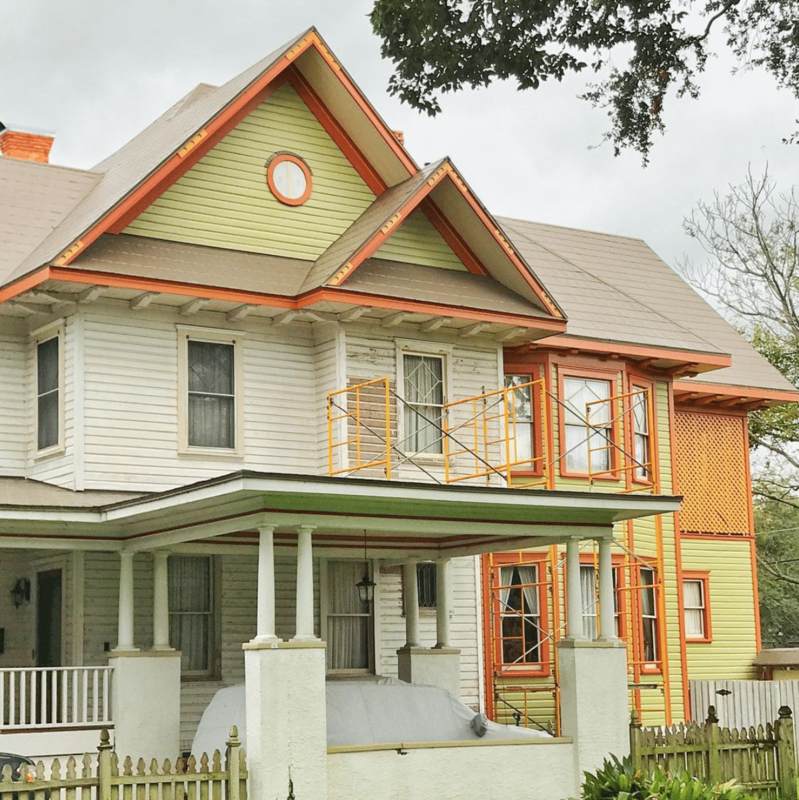 Fading exterior paint color is the first sign of paint film degradation. However, Atlanta’s top commercial and residential painting contractors admit that people don’t usually notice the changes in the color intensity mainly because fading occurs gradually. This may prevent property owners from implementing the right remedial measures that could stop the deterioration of the wall system. Fading should not be confused with chalking. Fading represents the excessive lightening of the paint color especially on the surfaces exposed to sunlight. Chalking, on the other hand, refers to the formation of a powdery residue on the wall surface as a result of a chemical reaction in the paint film. Although all exterior surfaces inevitably fade over time, here are four simple ways to ensure your business puts its best face forward and keeps it on for many years to come. Evaluate the things you cannot change – One of the things you cannot change is the position of your building. To reduce the adverse effects of different weather elements, always opt for paint products that can work harmoniously with the environmental factors which exert a heavy toll on your building. If your commercial property gets a lot of direct sunlight, for instance, you should choose light paint colors, which have been proven to absorb less sunlight than darker shades. Aside from color variations, wall paints also vary in terms of sheen. A higher gloss finish will reflect more light compared to flat paint, reducing the amount of light a paint color may otherwise absorb. The amount of UV light absorbed by a paint product dictates how long a paint job will last. Choose fade-resistant paint – Though it may seem obvious, opting for fade-resistant paint is one of the few things you can do to avoid fading exterior paint color. The best fade-resistant paints contain high-quality pigments and a sufficient amount of binder, which binds the pigment particles to the other ingredients to form a durable paint film. In addition, the binder ensures good adhesion between the paint film and the wall surface. As less expensive exterior paints often contain low-quality ingredients and lower volume concentrations of pigments and binders, they usually start to deteriorate after only several months from the application. As a general rule, high-quality acrylic latex paints have better color retention compared to oil-based paint products. Consider the quality of paint products – Paint technologies and products have evolved considerably over the past years. Nowadays, the type and quality of paint systems have a dramatic impact on the overall appearance, performance and service life of an exterior paint job. Adequate surface preparation along with the correct application of a high-quality paint product can help you avoid premature paint failure in the form of fading exterior paint colors, bubbling, peeling and cracking paint, efflorescence, mold growth, dry rot, etc. This will limit the maintenance and repair requirements, reducing your operating expenses. Don’t use paints prone to fading – Inorganic pigments like tans, beiges and browns are more stable on exterior surfaces than certain organic colors. As an example, bright reds, blues and yellows are particularly vulnerable to UV radiation and consequent fading. Using alkali-sensitive paints on highly alkaline surfaces like new masonry is another mistake that can lead to fading exterior paint color. Also, tinting certain types of paints or over-tinting a paint product may cause the paint to fade prematurely. At Performance Painting Contractors, one thing we cannot stress enough is the importance of timely maintenance and repairs. The moment you see fading exterior paint, small cracks, peeling paint, mold growth or dry rot, give us a call at 678-349-4988 . Atlanta’s painting contractors to paint the exterior or interior of your company may seem like a big expense, it is nothing compared to what you might pay later if a paint job isn’t up to the mark. Your house or Business talks about you, let Brook Painting contractor raise the standard of your house and business with the best quality and the best-looking property, anyone can call himself a painter but not everyone is one, one thing is to hold a brush and another one is knowing how to use it, make your self a favor and hire Brook Painting Contractors, Call us and from the first moment you will see why Brook Painting is your best option. Do you feel anxious in a yellow room? Does the color blue make you feel calm and relaxed? Artists and interior designers have long believed that color can dramatically affect moods, feelings, and emotions. “Colors, like features, follow the changes of the emotions,” the artist Pablo Picasso once remarked. Color is a powerful communication tool and can be used to signal action, influence mood, and even influence physiological reactions. So how exactly does color work? How is color believed to impact mood and behavior? If you have ever painted, then you have probably noticed how certain colors can be mixed to create other colors. “Given the prevalence of color, one would expect color psychology to be a well-developed area,” researchers Andrew Elliot and Markus Maier have noted. Despite the general lack of research in this area, the concept of color psychology has become a hot topic in marketing, art, design, and other areas. Much of the evidence in this emerging area is anecdotal at best, but researchers and experts have made a few important discoveries and observations about the psychology of color and the effect it has on moods, feelings, and behaviors. Of course, your feelings about color are often deeply personal and rooted in your own experience or culture. For example, while the color white is used in many Western countries to represent purity and innocence, it is seen as a symbol of mourning in many Eastern countries. Why is the color such a powerful force in our lives? What effects can it have on our bodies and minds? your house. Let the experts of residential painting do the best for you.